“A breathtaking new epic fantasy series. Morgan Rice does it again! This magical saga reminds me of the best of J.K. Rowling, George R.R. Martin, Rick Riordan, Christopher Paolini and J.R.R. Tolkien.” --Allegra Skye, Bestselling author This bundle includes the first three books in Morgan Rice’s #1 Bestselling fantasy series THE SORCERER’S RING (A QUEST OF HEROES, A MARCH OF KINGS and A FEAST OF DRAGONS). These three bestselling novels are all here in one convenient file. It is a great introduction to the SORCERER’S RING series. Over 200,000 words of reading, all for an incredible price of just $8.99! It is a great deal, and it also makes the perfect gift!The series tells the epic tale of the coming of age of Thorgrin, a special 14 year old boy, the least loved of his father, as he strives to become a warrior in the magical Kingdom of the Ring, and as he learns he has powers, and a destiny, he does not understand. An outsider, he must fight for acceptance as he strives to join the King’s elite Legion, and as he falls in love with the king’s 16 year old daughter. Most of all, he must learn who he really is, why his destiny is so important, and why the entire fate of The Ring depends on him. 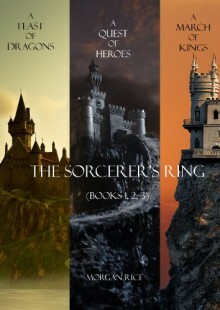 With its sophisticated world-building and characterization, THE SORCERER’S RING is an epic tale of friends and lovers, of rivals and suitors, of knights and dragons, of intrigues and political machinations, of coming of age, of broken hearts, of deception, ambition and betrayal. It is a tale of honor and courage, of fate and destiny, of sorcery. It is a fantasy that brings us into a world we will never forget, and which will appeal to all ages and genders.NOTE: In response to reader requests, the book has now been professionally edited and copyedited, and this file version has all the typographical and grammatical errors corrected.Book #4 in the series--A CLASH OF HONOR (BOOK #4 IN THE SORCERER'S RING) is now also available!